From the venerated Jerusalem Torah scholar and Kabbalist Rabbi Yaakov Hillel comes an extraordinary new book. Drawing from Torah, Midrash, Mussar, and Kabbalah sources, he guides us through our Jewish spiritual journey - through this world and into the next. 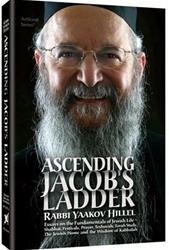 Like Jacob's ladder, which was firmly planted on earth but reached the heavens, these essays show us how living a truly Jewish life will bring us to the spiritual heights we long for, without ever losing sight of the ground - a healthy life and home. In an inspiring and engaging manner, Rabbi Hillel shows us how we can climb that ladder rung by rung. 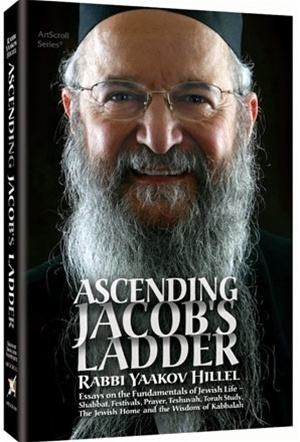 Covering such topics as the Jewish holiday cycle, Shabbat, prayer, the study of Kabbalah, and the role of the Jewish woman, "Ascending Jacob's Ladder" illuminates every aspect of Torah life. About the Author - Rabbi Yaakov Moshe Hillel is Rosh Yeshivah of Yeshivat Chevrat Ahavat Shalom in Jerusalem. A scion of great rabbis of Baghdad, he has authored dozens of books and hundreds of essays, and is a sought-after and inspiring speaker. His classes in Kabbalah, given to outstanding talmidei hachamim in Jerusalem, are among the most profound in the world today. Ahavat Shalom is one of the world's largest yeshivot and it includes an exclusive branch for the training of rabbinical judges and a select group of scholars engaged in the study of Kabbalah. The Rabbinical Court of Ahavat Shalom holds court sessions every day to resolve litigation in monetary matters.